Is there a keybind to minimize all windows, without a toggle? I know about the show desktop keybind (default Ctrl+Alt+D), which I use often enough. 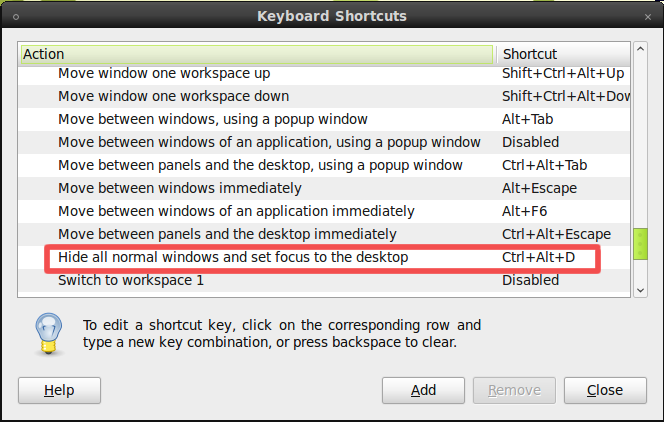 However, I'm looking for a way to minimize all windows without activating "show desktop". I'm interested in knowing where it is available, if not in Gnome/Metacity/Compiz, or some other way to accomplish this with a keybind. If it works as it should then add a shortcut: System ➜ Preferences ➜ Keyboard Shortcuts. Click on the Add button and fill in the fields as shown below, replacing YOURUSERNAME with your actual username. And finally double-click where it says Disabled and press your shortcut keys. 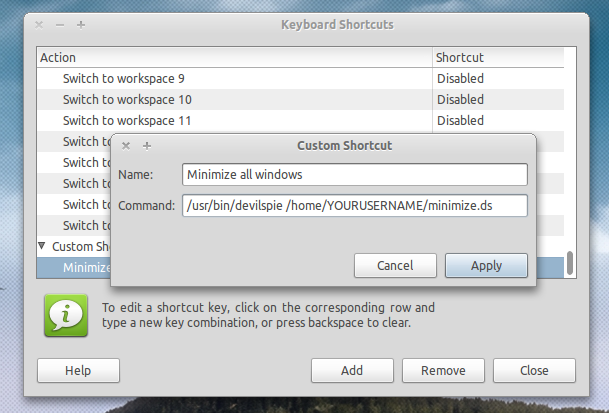 Then, create a new custom shortcut that executes the following command. This should do what you are looking for. This is built into Ubuntu Settings. Go to: Settings > System Settings > Shortcuts and Gestures > Global Keyboard Shortcuts > Select 'KWin' in KDE Component pull-down menu > Then scroll down to 'Show Desktop' > Assign a custom hotkey. Presto! Not the answer you're looking for? Browse other questions tagged shortcut-keys window-manager gnome-classic window-management or ask your own question. How to add a “Show desktop” icon to the launcher? Is there a keyboard shortcut for minimizing all windows except the active one? Is there a Unity equivalent of the GNOME panel 'show desktop' applet? Why does Classic Gnome desktop use unity-window-decorator? How can I change the window movement key when using Unity 2D? Metacity malfunction preventing custom Gnome session from launching? What is the purpose of Compiz (if any), inside Ubuntu 12.04, if I use gnome-classic (gnome-session-fallback)?